Many have been ready and willing to proclaim the respective deaths of Italian and German football since the turn of the millennium but neither prediction has come to pass. Boom and bust is part and parcel of the sport. English football is certainly not as strong as it was in its recent heyday, and there are a whole manner of statistics that can be used to support that argument. But this is not the time to discuss the death of English football, for its time will surely come again. Instead of bemoaning the lack of English representation in the Last Eight of the Champions League, there should be a celebration of the continental feast that we are due to savour. Malaga aside, this season’s premier European cup competition has witnessed the renaissance of some of the biggest and proudest clubs across the continent. Real Madrid. Barcelona. Paris Saint Germain. Juventus. Bayern Munich. Galatasaray. Borussia Dortmund. It feels as if the competition has transported itself back in time to the late 1990s. Perhaps because the intrigue and mystery is not diluted by the presence of an ‘Arsenal’ or a ‘Chelsea’, the Champions League feels genuinely cosmopolitan for the first time in almost a generation. In fact the competition, and the nature of the ties that the quarter final draw has produced, is the fiercest it has been since the 2002-3 season; ten years ago. Joining traditional powerhouses Real Madrid, Juventus, AC Milan, Internazionale, Manchester United and Barcelona at the quarter-final stage were Ajax and Valencia, both domestic champions. Ajax sides of recent past have struggled to reflect the reputation of those from yore; but the 2003 vintage of Christian Chivu, Wesley Sneijder, Steven Pienaar, Zlatan Ibrahimovic and Rafael van der Vaart stood toe to toe with AC Milan’s illustrious squad of a decade ago. Valencia, under the stewardship of Rafael Benitez, had become one of the most attractive outfits in Europe following their break up of the Madrid-Barcelona duopoly in La Liga. With a spine of Roberto Ayala, Pablo Aimar, Ruben Baraja and David Albelda, Los Che were eliminated on away goals by Hector Cuper’s formidable Inter Milan side. Since the re-structuring of the competition in 2004 abandoned the two-fold group stage the quarter-final line ups have often flattered to deceive. Two group stages acted to filter out the chaff, but lent an unnecessarily elongated feel to proceedings. Few would argue against the present set-up, though it has at times presented uninspiring draws as the climx approaches. 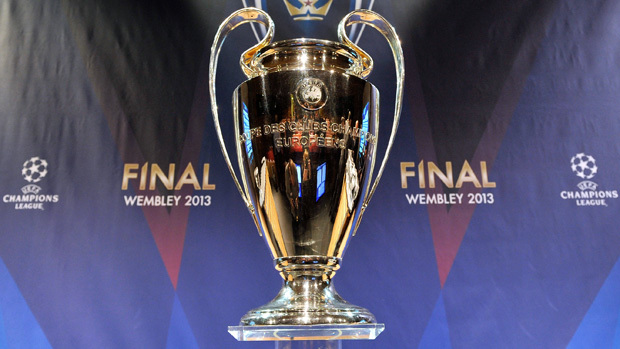 Consequently the last eight of the competition has produced a number of lightweight quarter-finalists; Roma and PSV Eindhoven were pulverised in 2007 (3-8 and 0-4), whilst numerous others have never threatened to gatecrash the establishment – Fenerbache, FC Porto (2004 aside, though that year was an anomaly in itself), Villarreal, CSKA Moscow, Schalke, Benfica and Bordeaux. Last season saw APOEL Nicosia become the first Cypriot club to reach the stage, but they were duly hammered 8-2 over two legs by Real Madrid. Bayern Munich strolled past a lacklustre Marseille, whilst Chelsea and Barcelona were too strong for Benfica and AC Milan respectively. The 2011 draw was even more disheartening; Tottenham Hotspur were dismantled 5-0 by Real Madrid, Shakhtar Donetsk 6-1 by Barcelona, whilst Schalke pulled of an implausible 7-3 victory over Inter Milan. Both enjoy handsome reputations and currently enjoy handsome leads at the top of their domestic leagues. For two clubs with such illustrious traditions and histories their rivalry is almost non-existent. 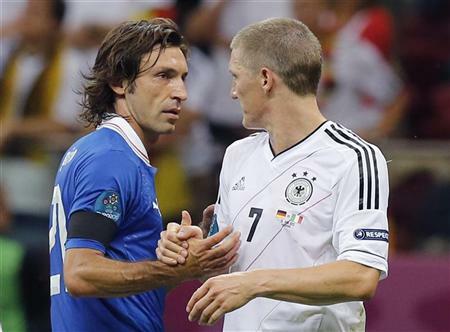 Schweinsteiger and Pirlo are set to re-acquaint following their Euro 2012 semi-final duel. Domestic interest perseveres as David Beckham’s PSG (as it is contractually obliged to refer to the Qatari-Parisians in the British media) face the behemoths of Catalonia. Zlatan Ibrahimovic has never won a Champions League and if there’s one club he’d love to beat, it is Barcelona. Malaga have been something of a surprise package considering their off-field problems, whilst Dortmund have cemented their position as everyone’s second team. Football hipsters will be salivating at the tantalizing prospect of Isco sharing a field with Mario Gotze and Marco Reus. Jose Mourinho comes face-to-face with two architects of some of his greatest moments in football management; Didier Drogba and Wesley Sneijder. But in their dramatic victory over Schalke, the Turkish champions showed that they are much more than their two stellar imports. Atavism and sub-plots reign supreme. Don’t bemoan English absentia, revel in it. This entry was posted in Previews and tagged barcelona, bayern munich, borussia dortmund, bundesliga, champions league, galatasaray, juventus, la liga, malaga, premier league, psg, real madrid, serie a, uefa by James Dutton. Bookmark the permalink.